the excellent sound and versatility the Hastings-based men have achieved with their first product. 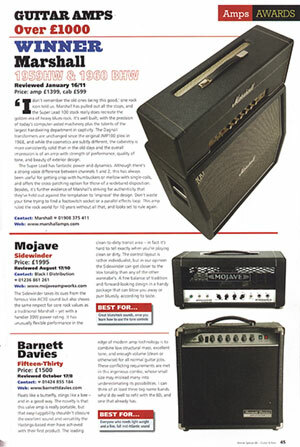 The leading edge of modern amp technology is to combine low structural mass, excellent tone, and enough volume (clean or otherwise) for all normal guitar jobs. These conflicting requirements are met in this ingenious combo, whose small size may mislead many into underestimating its possibilities. I can think of at least three big-name bands who'd do well to refit with the BD, and one that already has. Everyone who needs light weight and a fine, full mid-Atlantic sound.